Ringing in the New Year with lace knitting, a vegetable terrine, lots of project planning, and a geographic survey of our listeners. Join the community on Ravelry or email us with your thoughts. twoewes@twoewesfiberadventures.com is our email address. We’d love to hear from you! Kelly joined in the Mystery Knit Along with Cozy Up Knits. She’ll be using the Two Ewes Replenish Rambouillet for a 3 color shawl in 5 weeks. She is also participating in the 2019 Herbert Niebling KAL and the Yarniacs Self Indulgent Knit Along with some Niebling lace patterns. Her Glocklein is finished and she is planning for two more of these fun lace patterns. Marsha continues to work on Slack Tide by Poststitch and is making steady progress. The yarn is Concentric by Hikoo, which is singles that are not pied. It’s very “splitty” and difficult to knit with especially on knit two together, but it’s beautiful fabric. Marsha is waiting for a day to herself to work uninterrupted on Rabbit by Claire Garland. Marsha is also knitting Cloud Cover by Heidi Kirrmaier. It has an unusual construction. 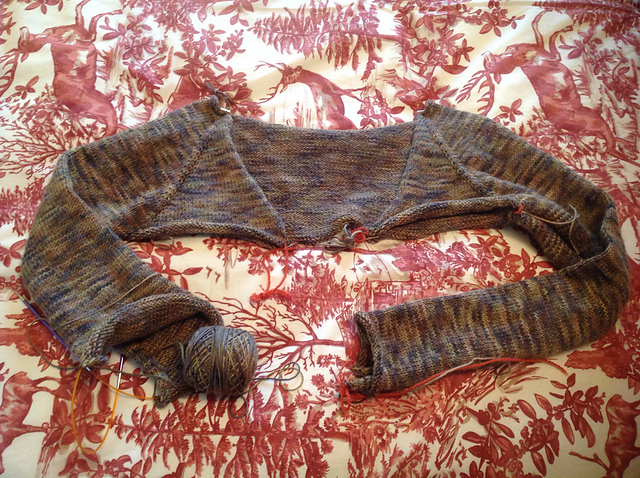 Knit yoke, then sleeves, then body, then collar. Marsha has finished first sleeve and started second. She’s still planning for SnowFlower by Heidi Kirrmaier The natural yarn arrived and she’s been thinking about colors. The “snowflower” will be the natural color but the CC can be anything! Marsha has carded a bunch of Wensleydale x Corriedale x Merino cross and has been spinning it. This fleece is a gorgeous dark espresso color! Marsha: 13 projects including 5 sweaters and 3 pair of socks. Ep 1: Who Are Ewe and What Are Ewe Doing Here? Other interesting and surprising locations! The Two Ewes have listeners in places around the world, including the Isle of Man, Uzbekistan, Latvia, Peru, Jamaica, South Africa, and Singapore. Author Stephany Wilkes has a book event at Books Inc. in Berkeley, California on January 8, 2019 at 7 pm. 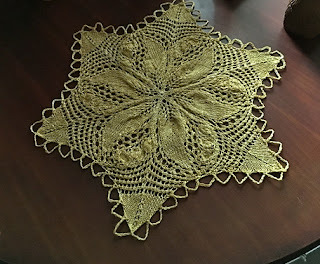 In February she will be speaking at the Treadles to Threads guild meeting February 27 in Contra Costa. Stitches West! Thursday, February 21 through Sunday, February 24. Marsha and Kelly will be attending the meet-up hosted by Yarniacs and 2 Knit Lit Chicks on Saturday afternoon in the lobby bar area. Madrona Fiber Arts Thursday, February 14 through Sunday, February 17 in Tacoma Washington. Marsha will be there with Kim aka KMDesigns. Just wanted to say Hi, From Perth, Western Australia, Australia. 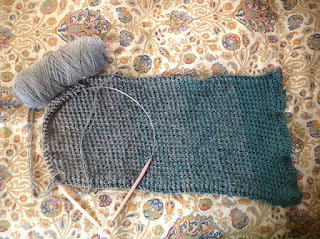 I love your podcast and subscribe, as I am a fairly new knitter having been a crocheter and patchworker prior, I have become quite addicted to knitting podcasts and have learnt a lot about techeniques, yarn and of course patterns. Please continue to enlighten and entertain me, thnak you.